friends.praxeme - PxFAQ: What is this strange thing called Logical Aspect? « PxFAQ: What are the services we *need*? Can we use upstream models directly in implementations? What is the interest of the Logical Aspect if I want to build an SOA? We put important efforts in upstream aspects, can we make some savings in the logical one? It represents the structured description of the system. 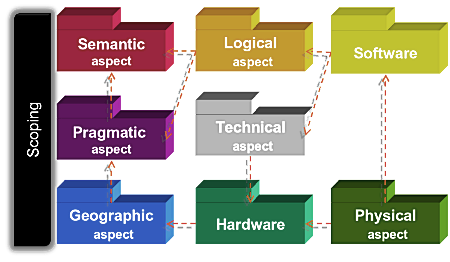 Upstream models (semantic, pragmatic and geographic) are formalized transcripts of what the enterprise is and needs. They don’t show the structures needed to represent the enterprise as a system. The logical model describes the architecture of the enterprise system in the same way as the design models (blueprints, plans, miniatures…) describe the architecture of a house. It is an important component for decoupling. It’s role is to decouple the life cycles of the real enterprise and the virtual representation that lives in the Information System. Information system is made of people and technologies that evolve very fast and in a very non regular rhythm. On the other hand, the enterprise itself evolves slowly but in a more constant way. At times, when the business context changes quickly the enterprise is able to absorb the changes with limited efforts even when the information system, and especially the IT thing, is not agile enough to quickly follow the train (of course this is a very short summary of what happens in each enterprises). The resulting fact is that life cycles are very different. Hence it is very dangerous to link them and try to force the nature of things. Query the business and the way it’s done when only a technology change is needed is a waste of time and money, and a big risk. Logical model is the template used to build the information system. It includes strategic views as well as needs and goals, because they are derived from upstream models. Moreover some strategic decisions make their way up to the logical models. For example, the decision to build a cross enterprise SOA is not taken by the logical architects. It’s an enterprise wide decision and must be taken by all interested parties. Logical model is a very important bunch of information to store and make available across the whole enterprise. It is very clear and precise as a description of what things should be and can be used in a number of ways after the main designs and built are over (explain how things work independently from technologies, compute impacts of business moves, authorize technological moves without changes in business, adapt quickly IS to strategic moves, etc…). Therefore it is an important part of the knowledge managed by Knowledge Management systems.